We will return with dignity, but we will soon be back in Serie A. These are the words of Mr. Leo Tonarelli at the end of the race, addressed to the girls reduced to tears and calls to gather near the bench. The new course of ASD Orlandia'97 will start in tomorrow, to tackle the A2 series, as an intermediate step towards a championship that has nevertheless shown that it can play by nature and ambition. It is back defeated for 2 - 1 from the trip to Bolzano. In the end not even the victory would be served. South Tyrol knows it well, together with the 'Hlandia' 97, is condemned by Lazio, a victorious surprise in Brescia. The Orlandia'97 ends last in the standings but until the last day has been played the chance to stay in the category, giving the weapons to a Lazio good to find unexpected resources. On the last day of the top league Bardolino Verona is imposed on the Reggiana for four goals to zero and wins a fifth place in the stand alone unthinkable at the start of the season. Mister Longega has to renounce the Da Rocha left in Brazil due to serious family problems and to surprise the young Battocchio in support of Gabbiadini and Girelli in attack. On the other front Milena Bertolini does not line up Mason in the eleven owner. Without defeats outside the home, a record of unbeaten season with 750 minutes without suffering goals, second best defense of the championship, the only team to have scored points against Torres, Daniela Sabatino top scorer of the championship. Here's the score of the Brescia, which finished third, but in the next season will start again from these exceptional statistics, to retry the race to the top of Serie A. In an unlucky day lionesses Grilli coach does Clutching the three points and greet the dream Champions caressed for the whole season. Congratulations to Tavagnacco for the milestone reached, and a big good luck for the wonderful adventure of next year. Hail in Tavagnacco: everything happened to the municipal derby championship between Graphistudio and Chiasiellis. From the sun to the rain, then wind and hail that affected the game of twenty-two on the pitch. The result was a heart-pounding match that Tavagnacco solved in the second half with six goals and a play. 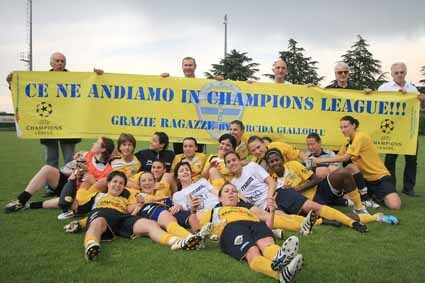 Graphistudio wins the right to enter the Champions League and to write a new page of the history of Friulian women's football. A sign Parisi (two football beads placed), Brumana (double for her), Mauro and Bonetti. First time, 9 'Chinello want to serve for Capovilla his shot is high, 13' of Mastrovincenz pull out, 20 'new shot of Mastrovincenzo saved by Penzo, 23' Parrini counterattack defenders to lob bypassing Penzo and the ball goes on the net, 36 'Squato goes on the right hand his shot is rejected by Leoni, 41' Chinello recovers the ball and goes to the shot that comes out just to the left of Leoni, 45 'Capovilla shot just above the crossbar. It is the last challenge. The decisive one. The one that requires heart, brain and determination. But above all, what can be an incredible salvation. 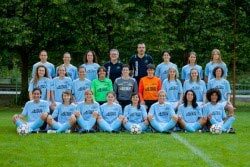 Twenty-fifth day in Serie A spotlight on women and Righi stadium in Bolzano, where Saturday (kickoff 15 hours) CFS of Mr. Antonio Alberti addresses the equal-ranking dell'Orlandia in 90 'crucial for survival in' elite of Italian women's football. Read more: It's the last challenge. The decisive one. In the next ninety minutes of the championship, all'Orlandia'97 will serve to win and wait for the victory of Brescia on Lazio to win salvation. 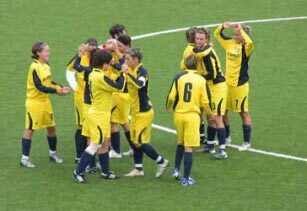 This is the result of the day as a result of the defeat remedied to "Ciccino Micale" against the swallows and the swirl of results, then acquired with the three points obtained from South Tyrol and Lazio draw at home with Torino. In today's match the paladins have once again shown they deserve the Serie A, they fought with determination and determination, thus overcoming the many unavailability in the starting staff. After more than two months of inactivity, the young Deborah Allum is reviewed at the center of the defense, by virtue of the concomitant absences of the disqualified Soro and Fiocco and of the injured Caciorgna and Iuculano. Chiasiellis finds the way to victory! The public Mortegliano expected and deserved a good victory of the tiger who, timely, did not disappoint the hopes of their fans to say goodbye with the three points. The victory was missing for too long and finally the Chiasiellis has thrown behind the rusts of a championship final subdued and finding the way to success. The biancocelesti started immediately forward, impacting however in the good defensive maneuvers directed by Captain Turra. At the 16 'however, the goal of the advantage comes: Maglio beats a punishment that slips inside the area and finds the head of Bortolus ready to bag. Read more: Chiasiellis finds the way to victory! First half 3 'cross from the left of Chinello, Capovilla's header, out, 10' Tombola free-kick just over the crossbar, 15 'free kick from Del Prete's left, Bortolus header overtaking 1's penalty in 0, 19 'Miani goes on the right his shot is off, 31' shot by Greek parade Penzo, 36 'cross from the left Chinello, head of Capovilla, draw, 38' error of the defense of Venice, Vicchiarello took the opportunity to mark the 2 to 1. 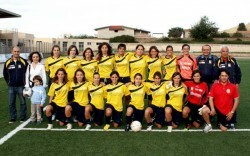 The Italian champions of Torres impose themselves with the goal of Elisabetta Tona. Gialloblu good to keep the race in the balance until the end. 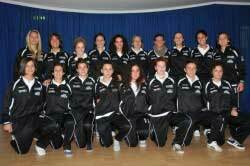 In the penultimate day of the top league the Bardolino Verona girls come out of the difficult field of Torres champion of Italy at the conclusion of a match well played by the Gialloblù. Mister Longega, an orphan in the attack of Da Rocha, engaged with the Brazilian national team, opts for a cautious 5-4-1 with Gabbiadin ie Girelli to alternate as an advanced tip.